Developed and optimised over many years within our high-throughput genotyping service laboratories in Europe and North America, the SNPline™ workflow consists of all instruments, software, and validated procedures we use to establish a highly cost-effective, flexible, and scalable PCR-based genotyping solution. With an open-format design and modular framework, customers have the option of adopting one of two standard configurations: the SNPline Lite and SNPline XL, or they can build a custom configuration that incorporates equipment they already own. Originally developed to enable high throughput genotyping using our - KASP™ genotyping chemistry in the LGC's laboratories, the SNPline workflow is essentially a high throughput PCR workflow and, as such, it also lends itself to almost all high-throughput PCR applications, including other PCR-based genotyping methods, and high throughput expression profiling using RT-PCR. The workflow is comprised of discreet modular components and procedures that have been fully validated in our service laboratory environment, and that we continue to use extensively today. The process begins with DNA extraction from biological samples to obtain template DNA for downstream PCR applications. The DNA is typically extracted in plate format, and these DNA samples are subsequently arrayed into either 96-, 384- or 1536-well plates depending upon the scale of the project. The appropriate PCR reagents are dispensed into the DNA plates during the liquid dispensing step, and plates sealed in preparation for thermal cycling. Once the thermal cycling stage is complete, reaction plates can be read to obtain the raw data. Data analysis is then performed to enable final results to be reported. Tying the process together into a complete workflow is Kraken™ workflow management software, which is an incredibly powerful tool that is integral to our entire service operation. Kraken takes control of sample management by tracking the storage locations of all sample plates and KASP Assay aliquots using 2D barcodes, and is also used for direct instrument control. Data analysis and reporting are also performed through Kraken, and this management software therefore provides a robust audit trail for the entire laboratory workflow. 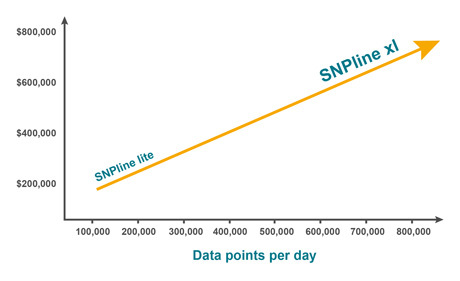 SNPline XL for higher throughput applications (up to 200,000 data points per day; 96, 384, and 1536-well plates). Each configuration has the flexibility of being customised to best suit the needs of the customer, and the open-format workflow enables a customer’s existing instrumentation to be incorporated if appropriate. 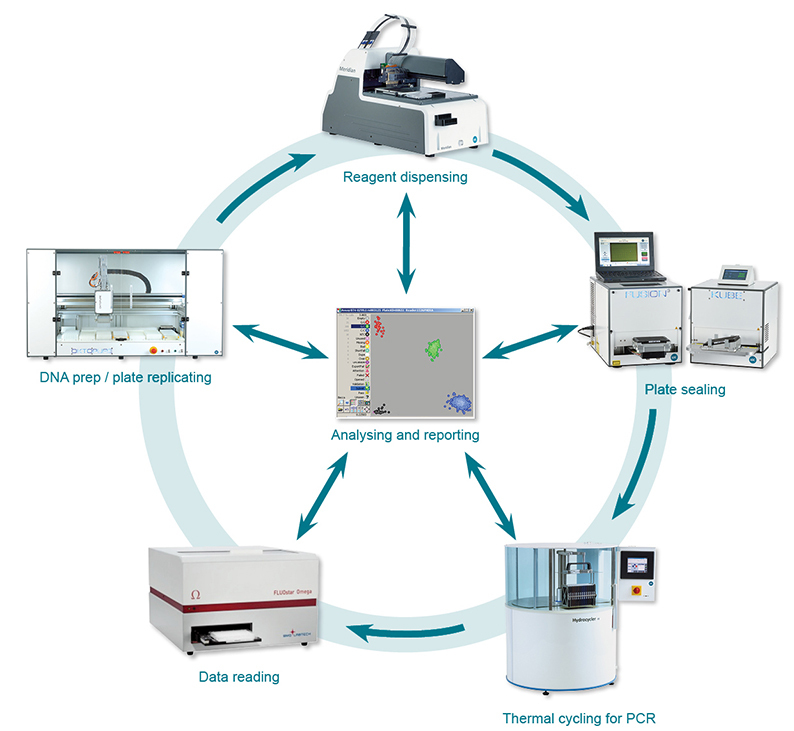 As illustrated in the above diagram, chip- and array-based genotyping methods are great for high throughput analysis, but they are based on a closed format design that requires sophisticated equipment which is both expensive to buy and to maintain. In addition, the chips and arrays are also relatively expensive, and are only cost-competitive when used at, or near to their full capacity. If all you wanted to do was repeat 20 SNP assays that generated inconclusive results in the first run, you would be paying the same amount to re-run those 20 assays as if you were running thousands of assays! 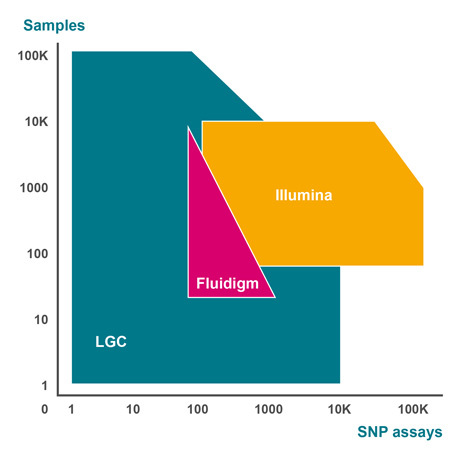 The advantage of performing PCR-based genotyping using LGC’s SNPline workflow is not only achieving a very low cost per data point (as low as 1 penny), but it has the added advantage that you do not get penalised when running just a few datapoints. It gives you complete flexibility to run 1, or 100, or 1,000 SNP assays against as many (or as few) samples as you would like, and your cost per data point does not change. At certain high volume thresholds chips and arrays become more attractive, and, for example, you certainly would not use PCR-based genotyping to do whole genome SNP analysis. But in reality, the majority of researchers are not interested in genome wide association studies. They are focused on a particular disease area, function, or trait, and often are looking to screen a broader range of samples against a select subset of polymorphisms previously associated with their area of interest. Our SNPline workflow provides for robust PCR set-up and processing in 96-, 384-, and 1536-well plates. As such it offers individual researchers or core facilities the ability to generate anywhere from 20 data points to over 500,000 data points per day at a very low cost per data point, and with the flexibility to run individual repeats with little to no impact on the cost per data point.